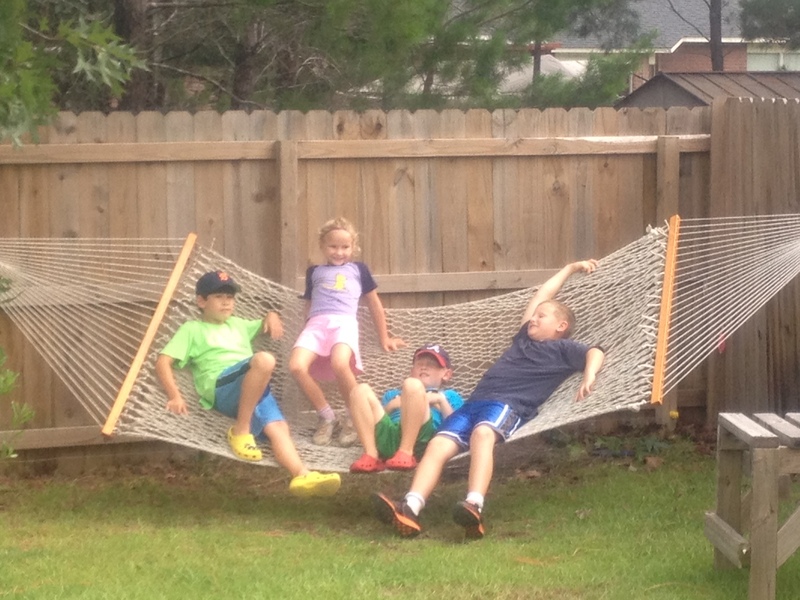 The kids are definitely enjoying their summer vacation so far! Apparently Jacob was working extra-hard this school year because I hadn’t seen him this happy in a long time. School and baseball just wore him out, I guess. They’re enjoying sleeping late, staying up late at night and not having to get dressed until lunchtime. Oh, the summer life! 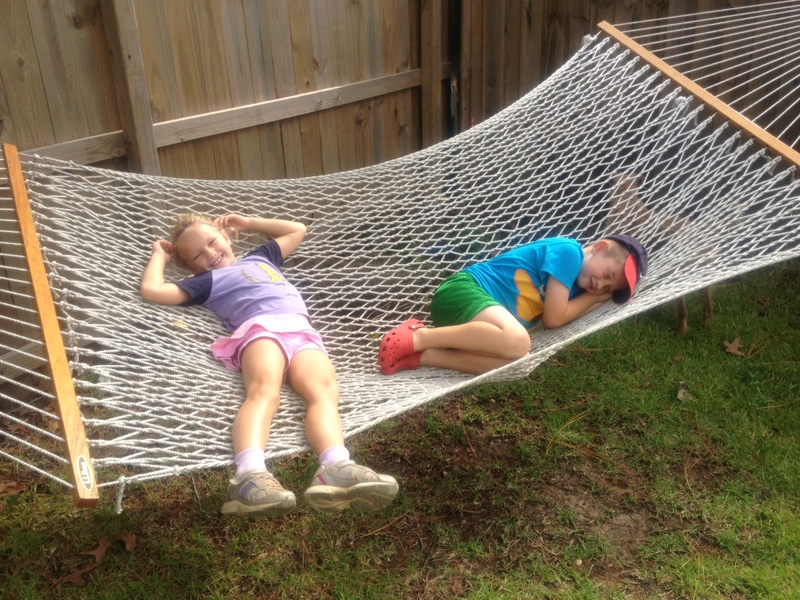 Since school ended last Thursday, the kids have been doing little else besides playing games, riding their bikes and playing catch in the backyard. Sadly, our area was hit with that Gulf Coast deluge of rain over the weekend so we were quite literally stuck in the house all weekend. Our rain gauge is broken, but I’d estimate around 8-10″ of rain at our house all weekend. We have good drainage so our house and our property was okay. While under our virtual house-arrest, the boys got along GREAT and Dave and I could catch up on several household tasks. We had visited Target on Friday and let the kids choose one video game and one board/card game each. We enjoyed all of that and then some: Uno, Phase-10, Rummikub, chess, Monopoly, Guitar Hero and even our new “Go” board game. I also helped out with this week’s Cub Scout Day Camp. Even though my boys can’t go (because of our upcoming Road Trip), I had received a request to help out with some craft preparations. 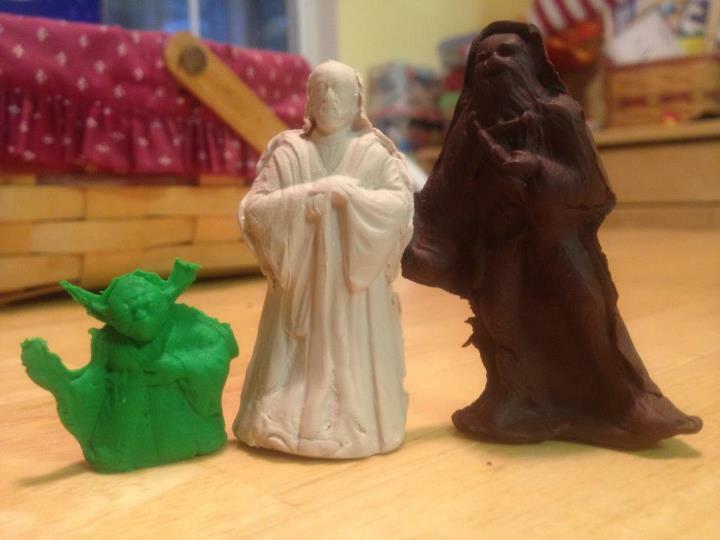 I offered my assistance and I received a task that was PERFECT for this past rainy weekend: FiMo clay Star Wars action figures. You press the clay into the molds, then bake a pan full of them at 230F for 30 minutes to harder. They are to be used in snow globes (Hoth?) that will be made with baby food jars. Here is a picture of what I was working on. Cute, aren’t they? They weren’t easy but with the rainy weather, we had all the time in the world! I had to make 150 of these. Of the dozen-or-so characters to choose from, there are the only ones that will fit through the mouth of a classic baby food jar. These were among the best of the batch. Most of the Yodas looks more like Gizmo from "Gremlins", and most of the Obi Wans and Chewies had no discernable faces. The molds for these were made by "Kenner" years ago. I tried to find a link to the mold product but can't find any. 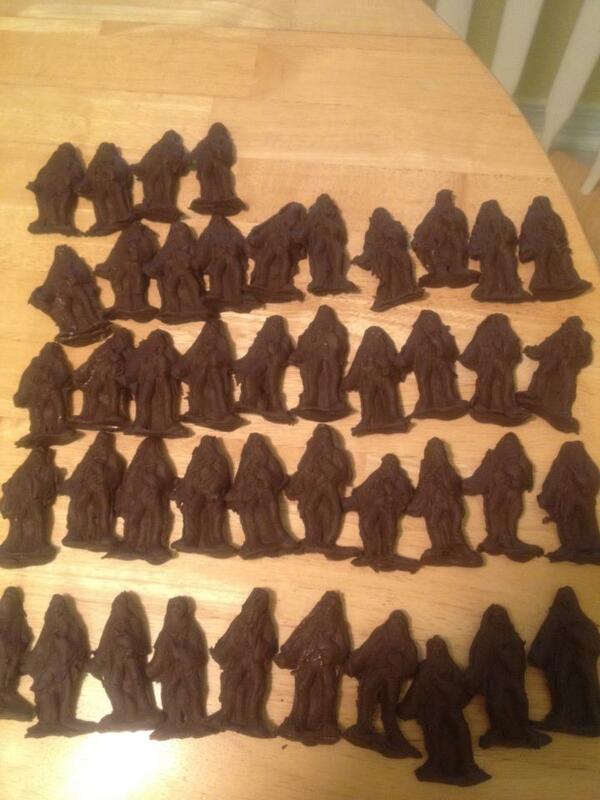 We're placing bets about which young Cub Scout will be attempting to consume these chocolate-brown clay Chewies. Luckily FiMo is non-toxic. After 3 days straight of no plans, today we had some plans. We took a risk that the weather would clear up by lunchtime: Sandra and I headed back up to Molino — this time with all our kids — to that same blueberry farm we visited 1 1/2 weeks ago. We had planned to visit Cambridge Farms in Milton but they’re closed on Mondays. I picked enough berries to take up to our relatives during our road trip this weekend. After picking berries, we enjoyed lunch at Olive Garden and then headed back home where the kids played for a bit before parting ways. Tomorrow is my official “get ready for our road trip” day: packing, cleaning, getting a food plan together for our travels and arranging care for our Howie. Tonight I had the boys choose their books and DVDs for the trip. 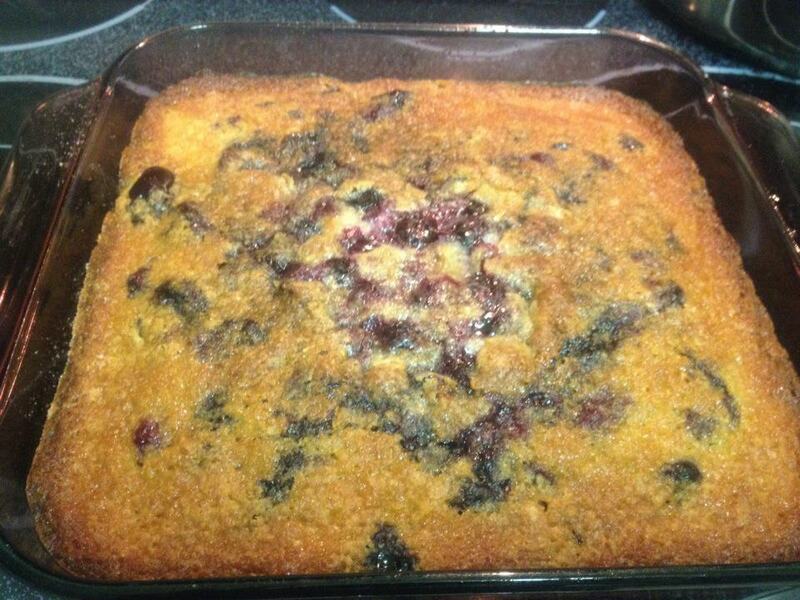 I laid out the blueberries to dry (they were still very wet from all the rains) and made up a quick cobbler for dessert. 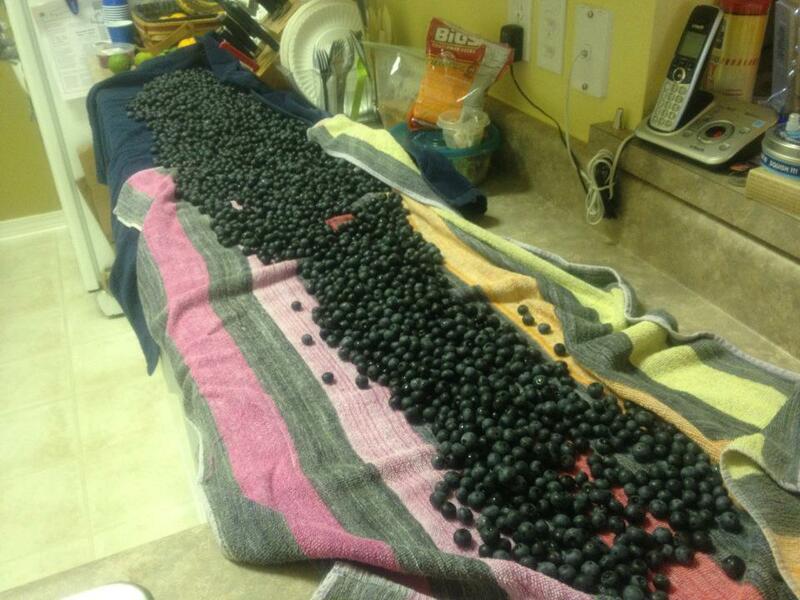 Before I packed up the berries for transport up to PA, I wanted to dry them out some. Old and blue-colored beach towels are perfect for this. You're looking at 11 lbs. of blueberries. Which at $0.75 per pound = $8.25 worth of berries! What a fantastic bargain!